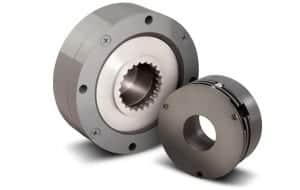 torque, styles, and applications, but we also design custom brakes and clutches, offer design and application engineering, and have a robust service and aftermarket segment that will enable you to recondition your existing equipment and source OEM and aftermarket parts at competitive prices. No matter what the application, Kor-Pak can help you find what you need and our customer-focused and hands-on approach will insure that you are always receiving the support and attention you need to keep your equipment running at optimal efficiency. As you navigate the website you will find many different brakes and clutches offered by Kor-Pak, and if you cannot find what you're looking for please contact a Kor-Pak representative today to help you. 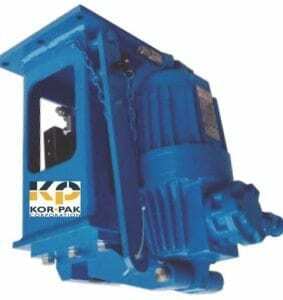 Kor-Pak can supply various styles of drum/shoe brakes that conform either AISE or DIN standards. 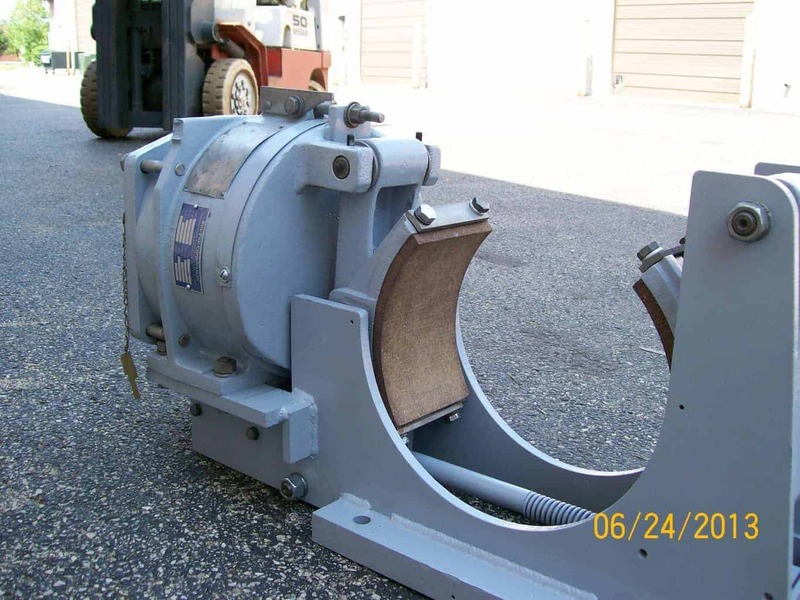 Our drum brakes are fail-safe, spring-set and electro-hydraulic thruster or magnetically released. 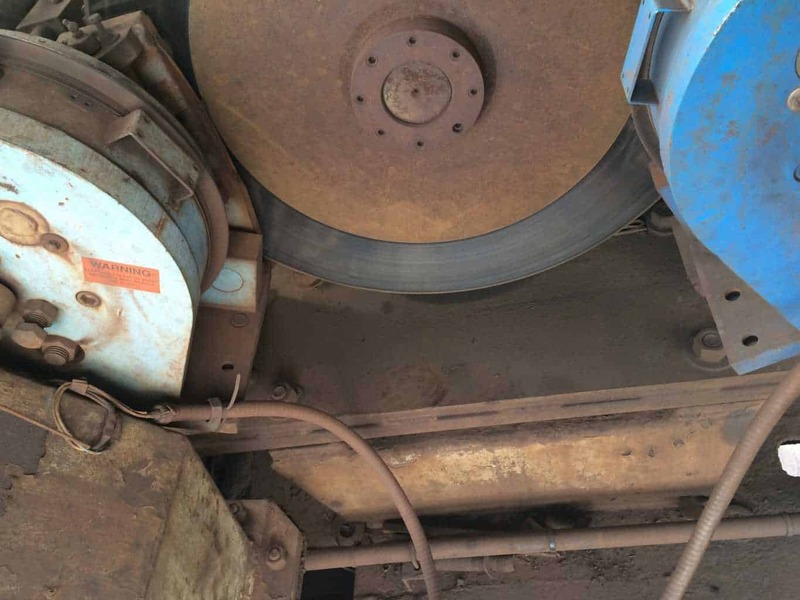 We can also provide all spare products and accompanying items such as brake drums, shoes, thrusters, coils (both shunt and series wound), controllers, and spare parts. offers a diverse portfolio of industrial disc brakes that cater to a wide variety of applications. Our wide range of caliper disc brakes are offered as either hydraulic or air applied/spring released, or spring applied and hydraulic, air, or magnetically released. Our robust caliper disc brakes are used ubiquitously and can be found in numerous unique applications and they can furnish extremely high torque requirements and concurrently withstand the harshest of environmental conditions. 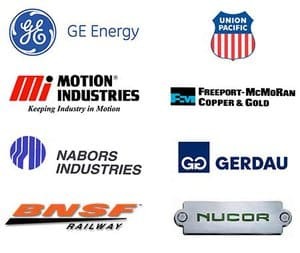 Our innovative and diverse selection of storm and rail brakes have helped industries persevere throughout harsh and demanding environments. Whether it be intense winds, seismic activity, or bracing your container when incurring heavy loads, Kor-Pak’s Storm Brakes will enable you to overcome these obstacles and achieve your industry-specific goals. Kor-Pak offers several options of Storm Brakes including: rail clamps, wheel grippers, rail grippers, and corresponding accessories. 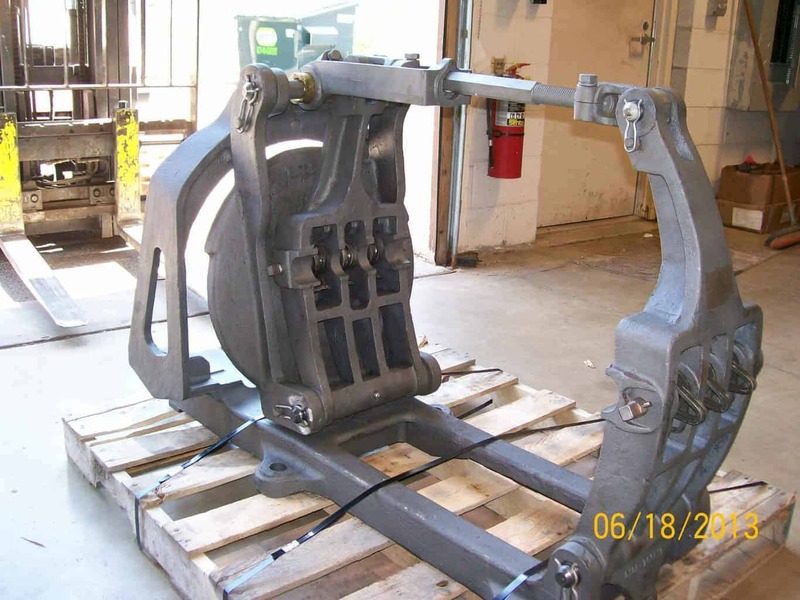 These are offered with various mounting options such as sill-beam, flange, or truck mounted and our rail clamps can be furnished with integral power units. Eaton Airflex Clutches and Bra (4).. The signature Airflex air-cooled disc clutches and brakes are which are custom designed to provide optimal braking solutions in various application. Eaton Airflex Brakes and Clutches feature a favorable torque-to-size ratios and low-inertia friction disc assemblies, they provide maximum braking performance in limited spaces. Featuring favorable torque-to-size ratios and low-inertia friction disc assemblies, Eaton's Airflex air-cooled disc clutches and brakes are designed to excel in a wide range of applications. Featuring a range of speeds, engagements and cycle types, Eaton Airflex AMCB, CBC, FSPA and DCB clutch and brake packages excel in a variety of specific applications. 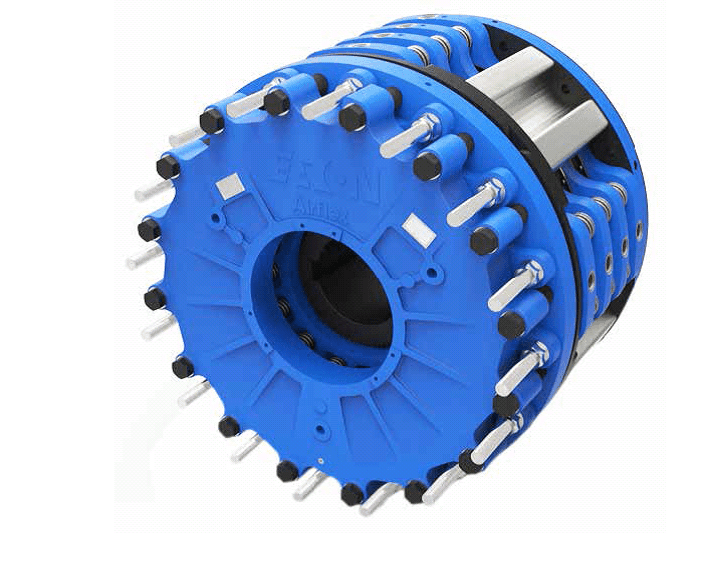 Eaton Airflex Expanding Clutches and Brakes are go-to solutions for braking and tensioning applications, and come in four different series spanning a range of sizes and features. Eaton Airflex Quick Release Valves (QRVs) are engineered to automatically close upon pressurization and open when a pressure drop occurs—reducing lag time to exhaust the system. Automatically engaging in the event of air pressure or power loss, Eaton Airflex Spring-Applied Drum Brakes are perfect matches for many moderate-speed, high-torque cyclic applications. Engineered with opposed piston designs and symmetrical split construction, Eaton Airflex DP and DPA caliper disc brakes maximize flexibility and help balance braking performance. Drum-style Eaton Airflex constricting clutches and brakes are available with a variety of torque capacities and other features to meet the requirements of the most demanding jobs. 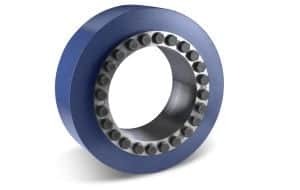 When paired with a spray, splash or through-the-shaft lubricating system, Eaton Airflex Oil- or Oil/Air-Cooled Multiple-Disc Hydraulic Clutches easily manage high-torque applications with small envelope ratios. Eaton Airflex Rotorseals transfer pressurized fluids from a stationary inlet to a rotating shaft end, providing individual control of components mounted on the same shaft, component lubrication and circulation of fluid systems. Eaton Airflex has developed four models of Water-Cooled Brakes with different advanced features and characteristics to meet the requirements of even the most severe applications. 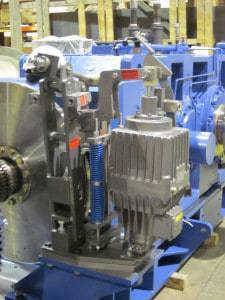 Take a look at the Eaton Airflex Water Cooled Brakes Brochure. 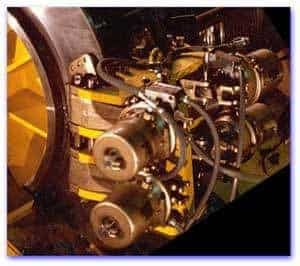 Johnson designs and manufactures a range of products in house including hydraulic, pneumatic, spring-set or manually applied caliper disc brakes and brake systems for use on hoists, conveyors, propulsion systems and other rotating equipment. Johnson also produces electro-magnetic and electro-hydraulic thruster drum and disc brakes which are in service around the world on cranes, hoists and other material handling and power transmission equipment. 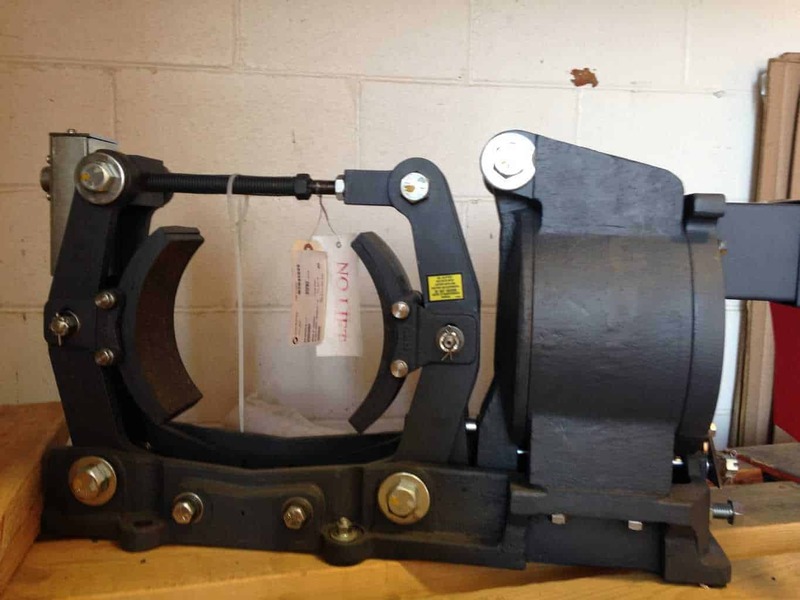 Johnson also designs and manufacture Storm and Parking brakes. 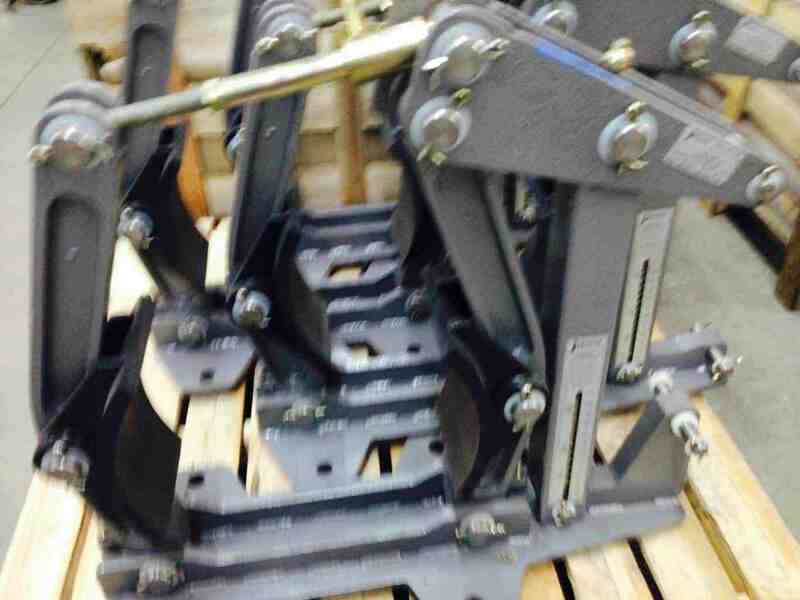 Storm brake systems include automatic and manual rail clamps, rail brakes and wheel clamps. 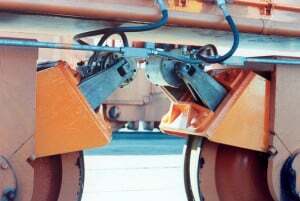 These emergency braking systems are used on cranes, stacker-reclaimers, loaders and other forms rail mounted equipment. 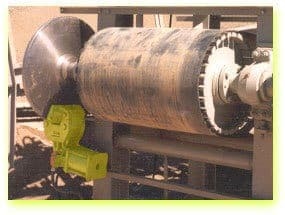 Kor-Pak can provide you with custom engineered industrial braking systems designed specifically for your unique application. This may include assisting with the brake selection process and performing a site visit and interactive project management to design and implement the optimal and most efficient system available. Kor-Pak provides a diverse selection of spring-set, magnetically released (failsafe) caliper disc brakes for Service and Emergency Duty applications. 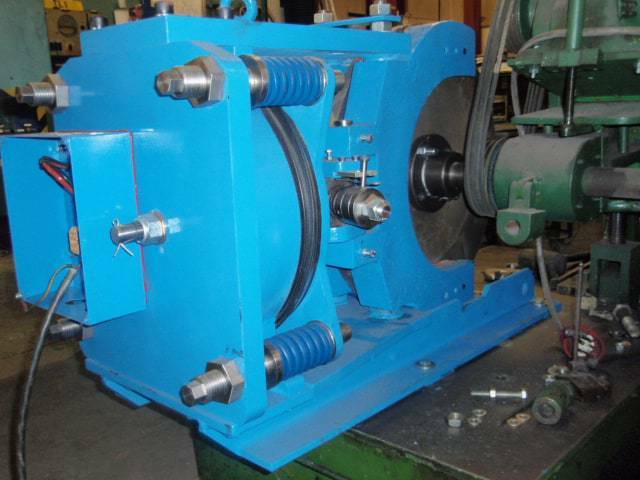 Single or dual caliper design magnetic disc brakes are available, manufactured to the highest engineering standards. [caption id="attachment_1724" align="alignright" width="350"] Dual Caliper Magnetic Disc Brake[/caption] [caption id="attachment_2742" align="alignright" width="300"] DC Magnetic Disc Brakes on Outdoor Ship Loader/Unloader[/caption] Features of Magnetic Disc Brakes Failsafe: spring-set, magnetically released Fabricated steel mechanism, all pins ground stainless steel, high temperature non-asbestos friction linings Magnet is DC tractive type with ensapsulated coil and screw-off release nut with optional switch Optional Limit Swtiches to monitor release/set or wear Magnetic Disc Brakes on Outdoor Shiploader/Unloader Crane Special materials, tests, or finishes as required Magnetic Actuator is 100% continuously rated up to 40 degrees celsius ambient Airgap dust and drip protected by neoprene gaitor Terminal box IP55 enclosure Brake release and set times are reduced by separate brake control unit to apply increased power and magnetic force during a short preset start period. Control units are enclosed ventilated drip proof IP22 for DC supplies or totally enclosed IP55 with rectifier for 1 or 3 phase AC supplies. 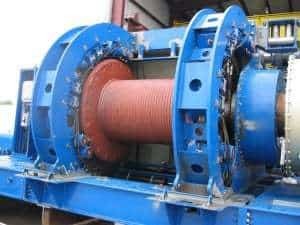 Applications: Mechanical handling equipment, cranes, winches, conveyors and mills, Emergency stop brakes installed on flange of drum winding barrel. 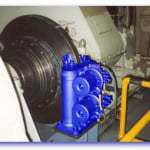 Stearns manufactures a comprehensive line of standard and special AC and DC industrial brakes and clutches. All-Inclusive Supplier: One of Svendborg's many benefits lies in its ability to provide complete turnkey braking solutions. Svendborg can offer customized brakes, power units/actuators, and controls (PLC) to create a complete solution that enables a seamless design. More Information: For more information about Svendborg products, contact a Kor-Pak representative. Click HERE for a Svendborg brochure. 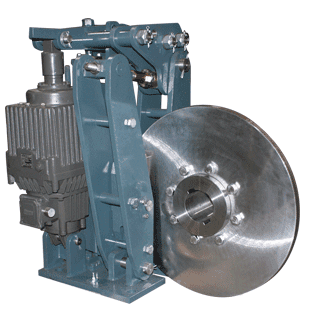 Thruster Disc Brakes are successfully used in many industries for various applications and Kor-Pak Corporation is your primary source for Thruster Drum brakes sales, service, and support. Thruster Disc Brakes are spring-set and thruster released; the thruster is electro-hydraulic, 3-phase, including a motor and hydraulic fluid. 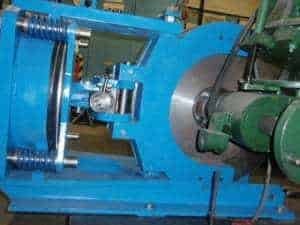 When power is removed, the friction lining of the brake pad applies to the rotating disc which creates friction and ultimately stops the rotating disc from moving. Thruster disc brakes possess a scalable torque tube which means that torque can be ostensibly adjusted which is ideal; for instance, as the linings gradually bed into the wheel (burnish), greater mechanical braking torque will be achieved and consequently the torque may need to be reduced. Compared to magnetic disc brakes, the brake operator can set the exact torque amount which yields more precise braking and enhanced safety. Thruster disc brakes also provide a clean, efficient, and economical package. Thrusters can accommodate high temperatures, especially with the addition of silicone fluid and high-temperature kits. Furthermore, a lowering valve/time delay can be added to the thruster to time the setting of the brake, and set/release limit switches can also be added. 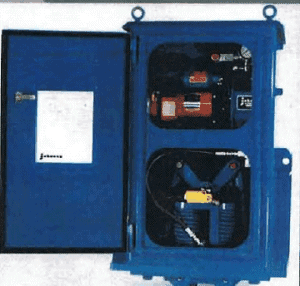 This is an ideal setup to be used in conjunction with variable frequency drives. External torque springs and self-adjust mechanisms for lining wear compensation are also ideal features of these brakes. Thruster disc brakes consist of an electro-hydraulic actuator/thruster and the movement. 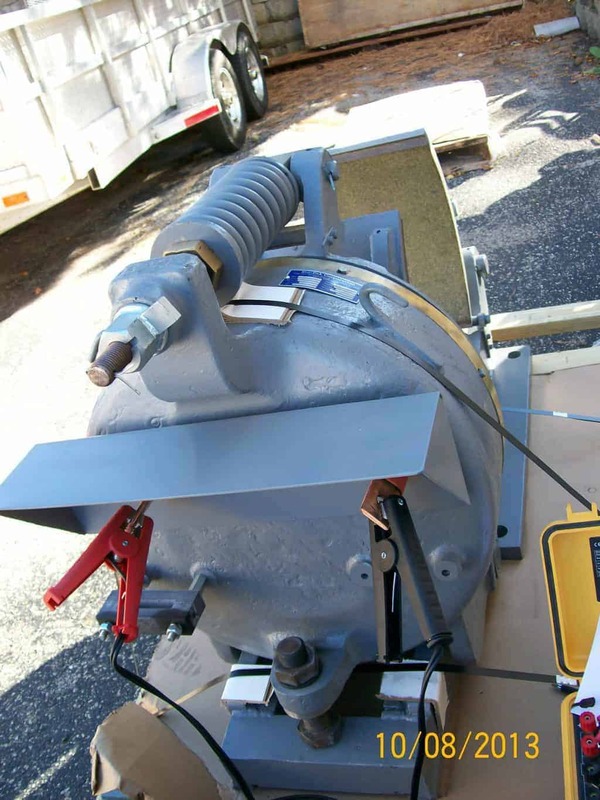 Thrusters can be repaired for an affordable price and reconditioned to “like new” condition. Brake pad can be easily replaced or relined, and the movement will last long and may need to be reconditioned on occasion. 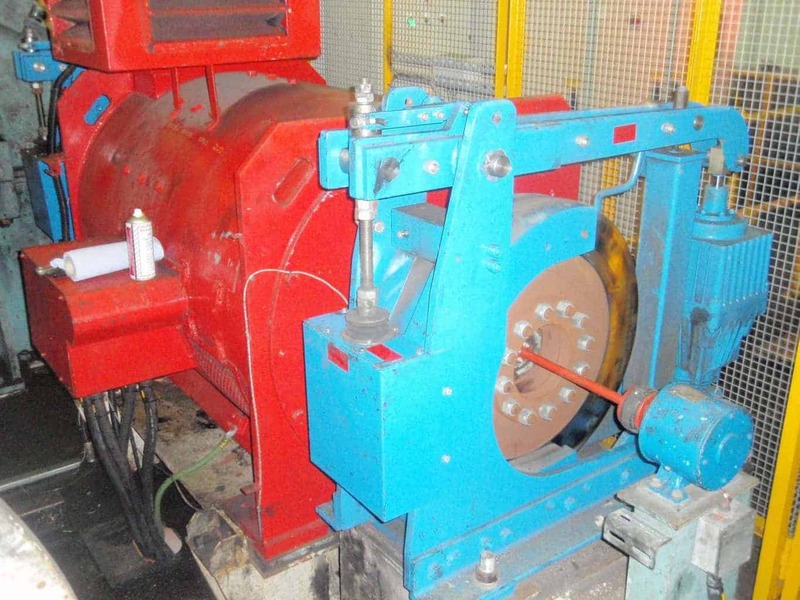 Overall, thruster brakes are designed to be “hands-off” and maintenance friendly brakes, making them an ideal choice for numerous applications such as steel mills (i.e. 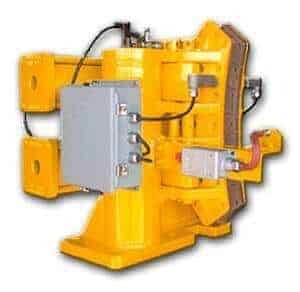 hoist and bridge/trolley brakes in melt shops), moveable structures (bridge brakes), container crane brakes, and many more. Reconditon thruster brake assemblies and actuators Design and engineer new thruster brake systems for custom applications Provide field service/support to help troubleshoot Provide on-site training for maintenance personnel Upgrade/retrofit existing brakes with thruster-style brakes Provide accessories: spare parts, discs, enclosures, limit switches, pads, reline brake shoes, pins, self-adjust mechanisms, actuators and many more. Integrate entire systems: thruster brakes, variable frequency drives/controls, PLC, etc. 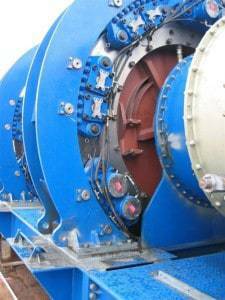 At Kor-Pak we are Wind Turbine Brakes System expert Contact a Kor-Pak representative today to assist you with your wind turbine braking needs. 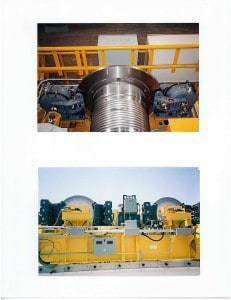 There are many aspects to windmill brakes, or wind turbine brakes and Kor-Pak covers them all. 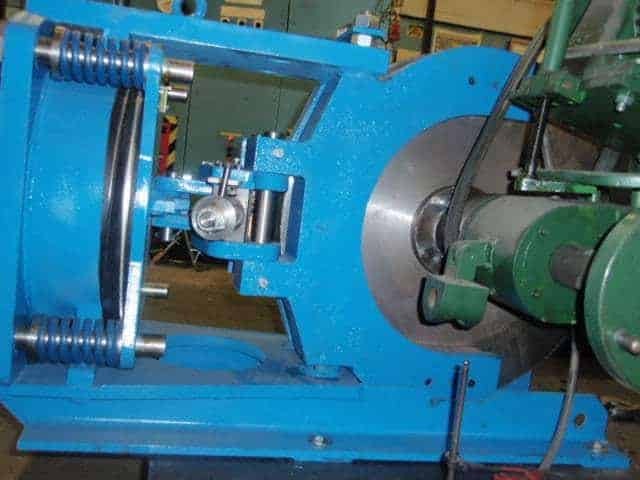 You can get expert advice on yaw brakes, blade pitch brakes, and rotor brakes as well as rotor locks, shaft locks, and linear actuators. 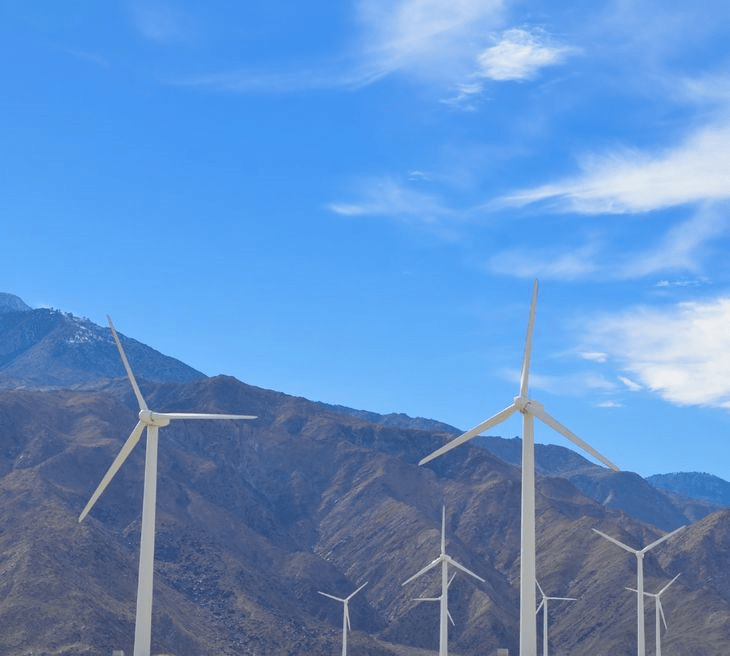 For a reliable partner in your wind turbine brake needs, contact Kor-Pak today. [caption id="attachment_3988" align="alignright" width="300"] Windmill Rotor Brakes[/caption] Kor-Pak rotor brakes are in operation today on hundreds of wind turbines around the world. 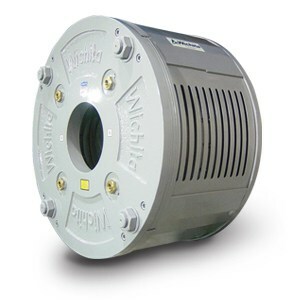 All models are fully assembled,provide high levels of reliability,easy electronic monitoring and maintenance,and are available with organic or metallic linings. Friction liners are carefully sized to ensure adequate heat dissipation during an emergency stop, with even pressure distribution across pad surfaces. Models are offered in a range of braking forces from 100N to 1MN to meet the braking torque requirements of the most common turbine sizes. 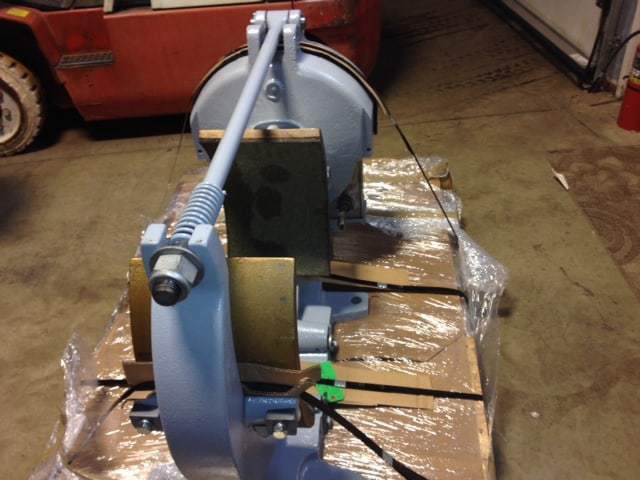 Rotor brake models are available as both standard and floating models. 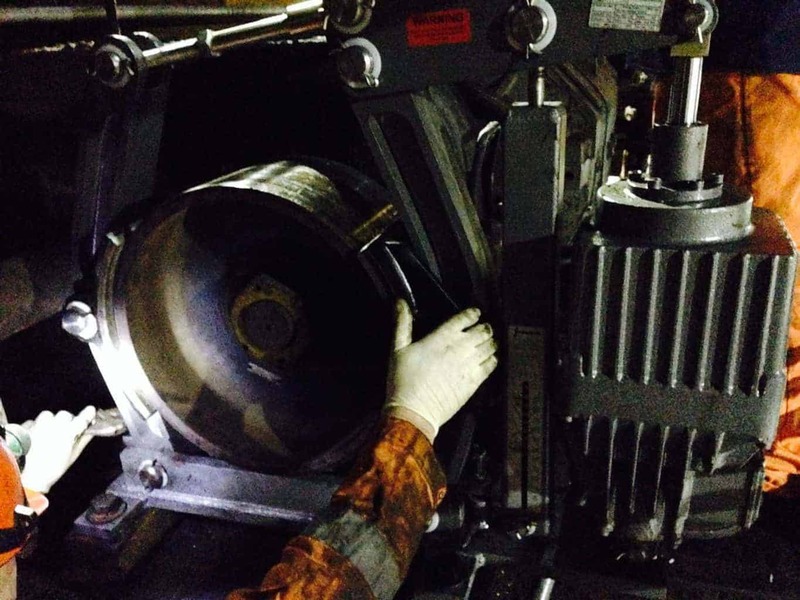 Floating, single-sided brakes are mounted on sliding bushings to save space on the installation. 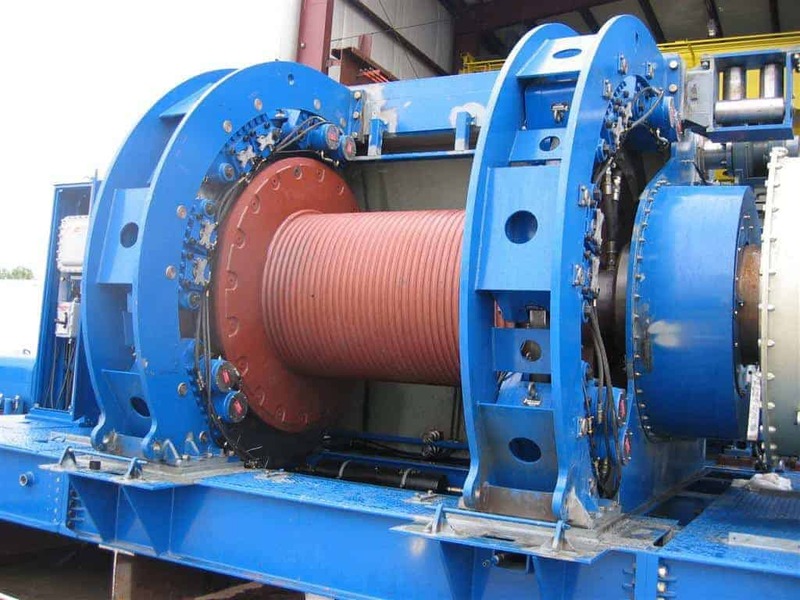 Our spring-applied, hydraulically-released, caliper brakes are typically mounted to a turbine's main rotor shaft, between the gearbox and the generator, and used primarily as safety brakes during emergency stops under high wind conditions. 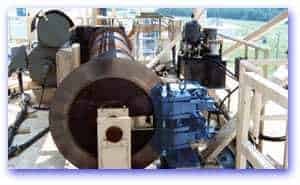 All units are engineered to handle the large output torque reduction generated by the very high ratios found in wind turbine gearboxes. Rotor locks are used in the wind turbine industry and are typically mounted to the turbine´s main rotor shaft, between gearbox and generator. A rotor brake is primarily intended for use as safety brake during emergency stops under high wind conditions. The rotor lock is activated by running the lock bolt into the lock disc using hydraulic power; a "locked" signal is then transmitted to the control system. 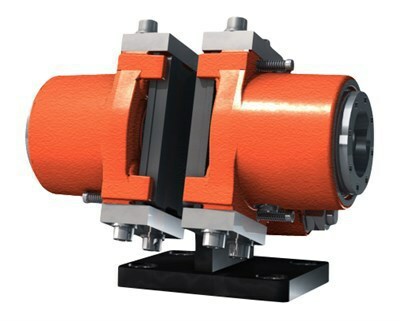 Our rotor lock units are engineered to handle the large output torque generated by the high ratios found in wind turbine gearboxes. 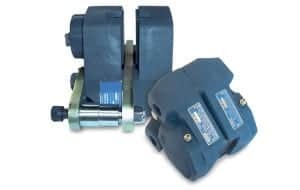 Our broad range of standard actuators can be custom-configured to meet specific applications including special pin to pin and stroke lengths, special end fittings, mounting brackets, paints, and lead wire lengths. Load capacity up to 12,500 Nm. The rugged B-Track linear actuators are completely sealed and designed for tough, high load applications. They incorporate high strength, high quality components to provide years of trouble-free performance in harsh environments. Models feature a ball nut screw drive with integral load holding brake and overload clutch. Efficient power use, compact package size, excellent corrosion protection, rugged spur gearing, synthetic lubricants and high performance motors provide maximum capability and value. Our Blade Pitch Brakes are electrically-released, spring-set brakes that offer a high-performance, cost-effective solution for applications that require both “static” holding power and the ability to withstand high inertia dynamic stops in an emergency situation. Each of the three blades on a typical turbine can be individually positioned (rotated) to achieve maximum efficiency while operating in changing wind conditions. 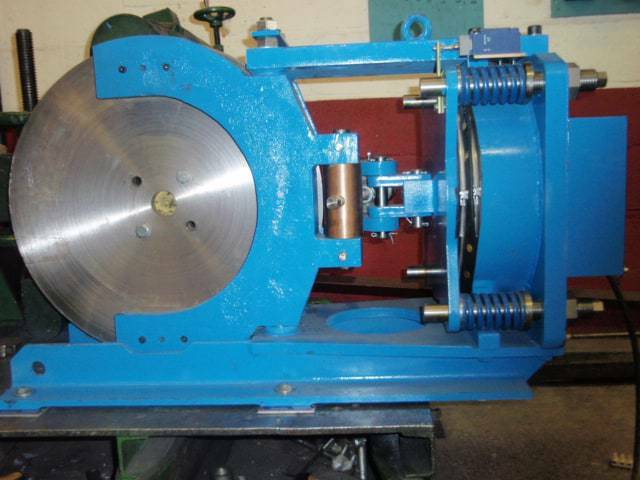 The electromagnetic brake is mounted outboard of an inductive encoder which is mounted to the back of a motor to position the blades to the proper pitch. In normal use, the brake functions as a static brake to hold the blades from rotating in a power-off situation, during routine maintenance or for other reasons. Our blade pitch brakes also offer the advantage of being a one-piece design, fully-enclosed and painted to withstand extreme environmental conditions (salt-spray, condensation, water, etc.). 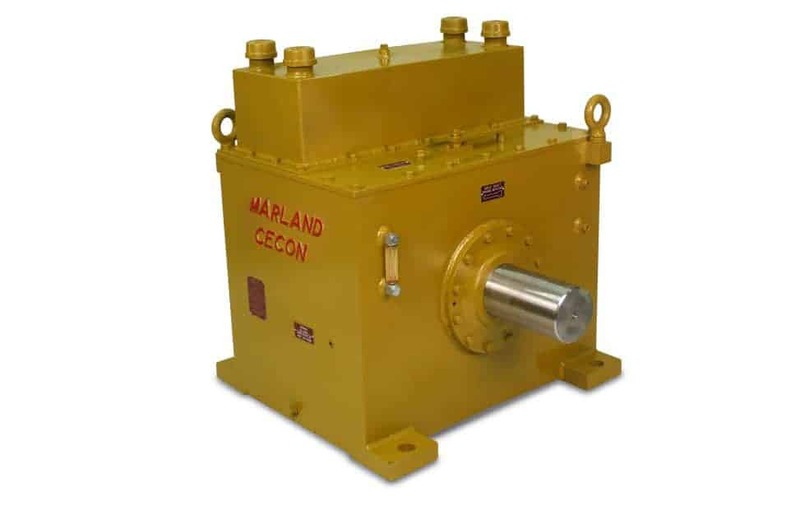 Our hydraulic (HLD) and mechanical (MLD) locking devices are custom engineered for a lightweight,high torque connection between the turbine main shaft and gearbox. Units are domestically manufactured to provide years of trouble-free service in wind turbines rated up to 3 MW. The greatest advantage of the HLD (Hydraulic Locking Devices) is the significant time savings during installation. With larger diameters,such as 20.8 in. (530 mm),the HLD can be tensioned within only a few minutes, compared to several hours required for a mechanical locking device. 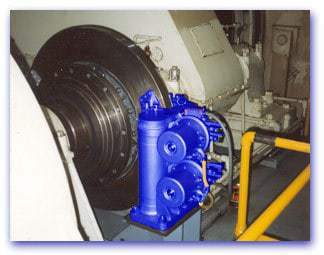 The hydraulic pump required for assembly can be a stationary unit,but the use of a hydraulic hand pump is also possible for tensioning at difficult-to-reach places such as the turret of a wind turbine. 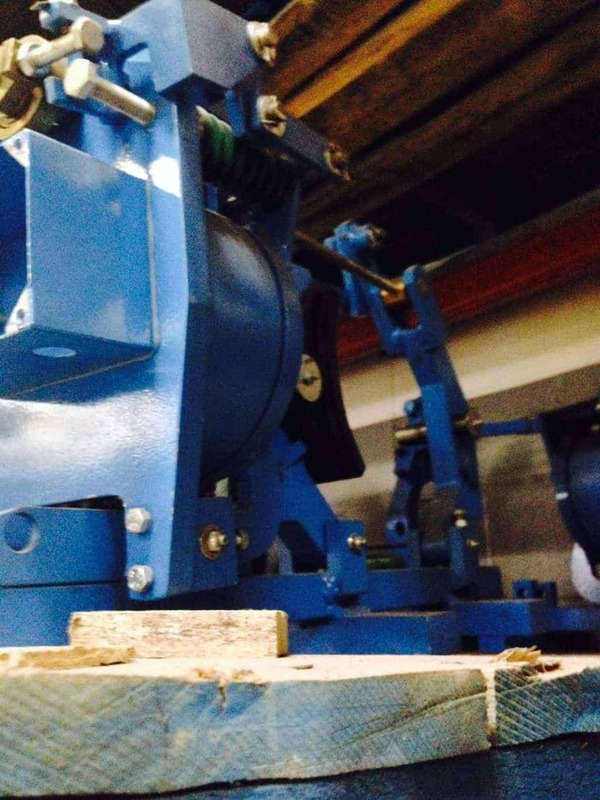 The MLD (Mechanical Locking Device) units eliminate the need for keyways or splines,provide unlimited shaft positioning,and feature zero backlash,reduced shaft stress,and high contact pressure for greater torque. The MLD series has the ability to fit into smaller installations while only requiring standard tools to assemble. All units are pre-assembled,ready to install. Torque range up to 4,425,372 ft.lbs. (6,000 kNm). A wide range of possibilities is available with outer diameters up to 57.1 in (1,450 mm),and shaft diameters up to 29.5 in. (750 mm). 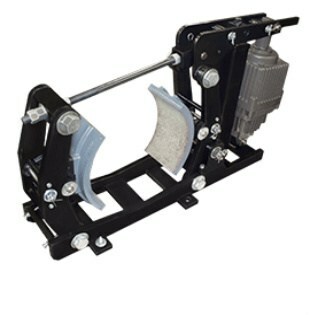 Ameridrives is also offering HTS (Hydraulic Tensioner Systems). These products are all custom engineered for the customer. Modular,light weight design allows for versatile application. HTS can reduce the installation time of mechanical locking devices 80-90%. Kor-Pak provide customers with high quality OEM and after marketing brake pads for wind turbine brakes. In addition to the brake pads, we carry brake pad assembly for Svendborg BSFI 200 Hydraulic Brake. Contact us to meet any friction material need. Dual Caliper Balanced Load Dis (2)..
Kor-Pak’s Dual Caliper Disc Brakes blend best of both worlds: the balanced torque of a drum brake and the even contact of a disc brake. 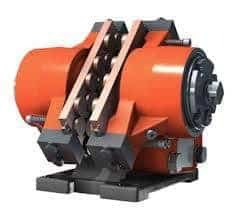 This is achieved by featuring twin calipers which interface with the disc at symmetrical points which mitigates the risks associated with tangential forces occurring at uneven contact points. Reduced Costs of the Gear Box due to reduced distance between input and output shaft. Zero Overhung Load/Balanced Torque means a lesser propensity for the shaft to twist and potentially break. This means a lesser likelihood of a catastrophic failure from occurring. Unequivocally, the benefits of a Dual Caliper Disc Brake exceed the costs. To learn more about these brakes, please contact a Kor-Pak representative who will be delighted to tell you more about what these fine braking systems have to offer. Our innovative and diverse selection of storm and rail brakes have helped industries persevere throughout harsh and demanding environments. 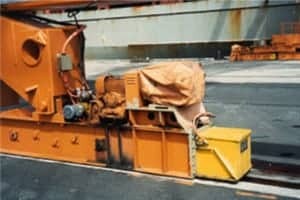 Whether it be intense winds, seismic activity, or bracing your container when incurring heavy loads, Kor-Pak’s Storm Brakes will enable you to overcome these obstacles and achieve your industry-specific goals. Find more information about oure Rail Head Clamps. Contact us with any questions or to place an order. 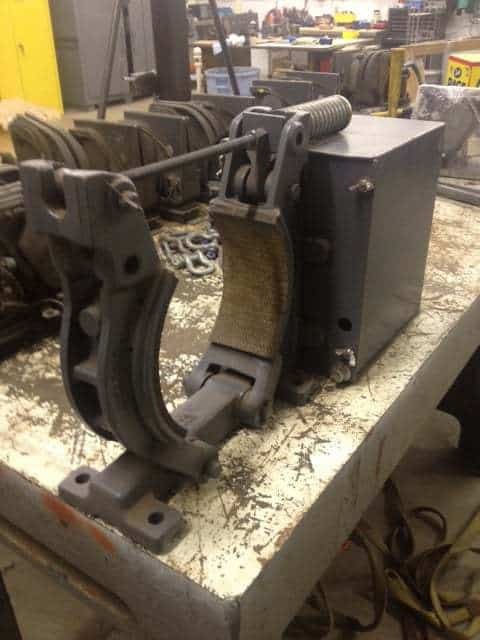 A similar style of Storm Brake, Rail Brakes incorporate a hardened tool steel shoe, which is applied directly to the top of a rail head by spring force. 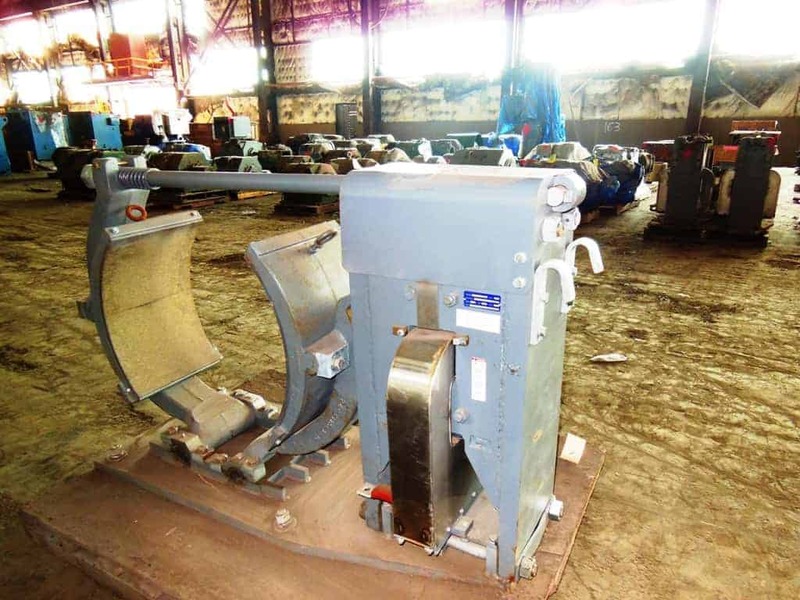 Rail brakes are sill-mounted with shims and plated emergency release bolts. 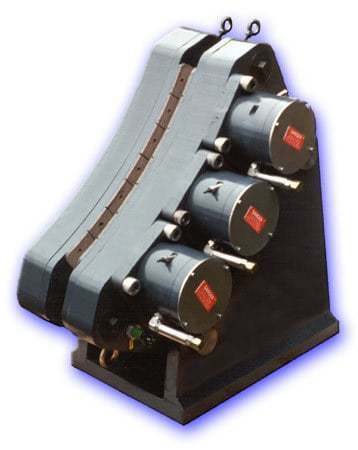 The spring stack can be varied to deliver the required holding force. 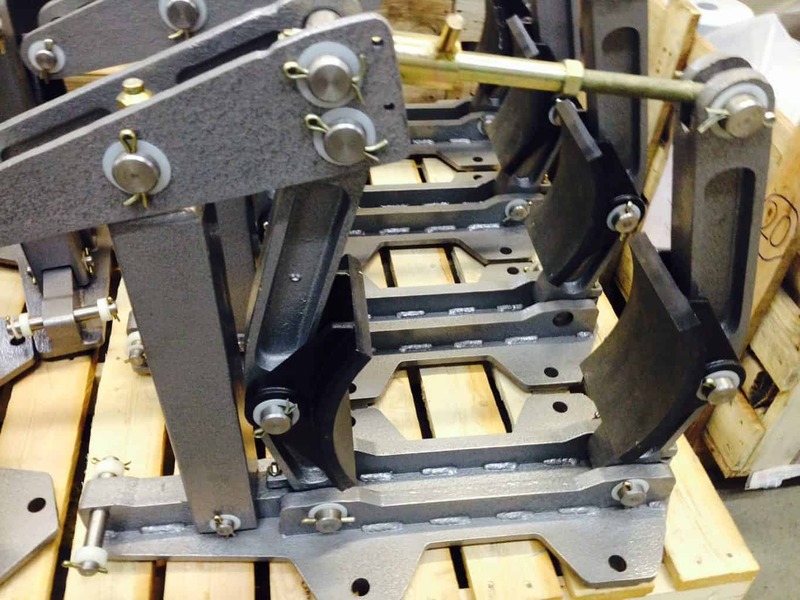 Lubrication points are provided at the head/shoe mating surfaces. 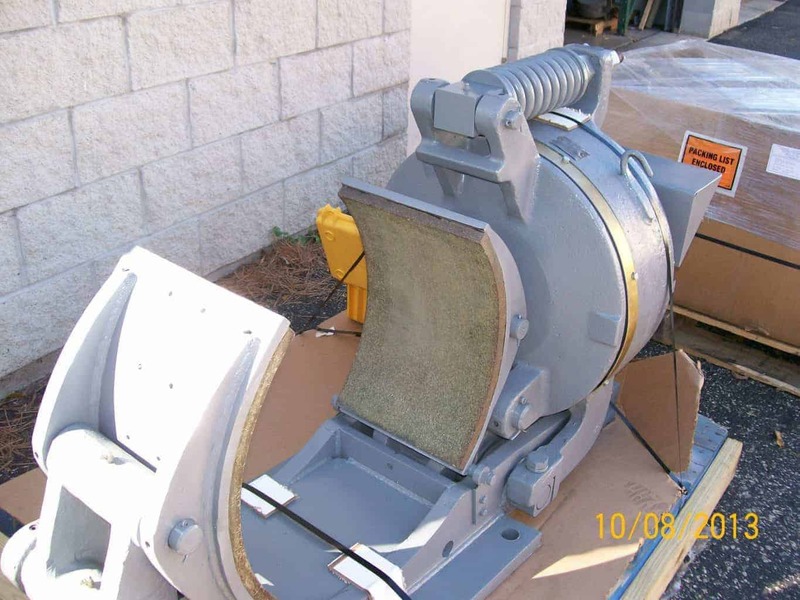 Features and options include a release indicating/interlock limit switch, special alloys, coatings and custom mountings. 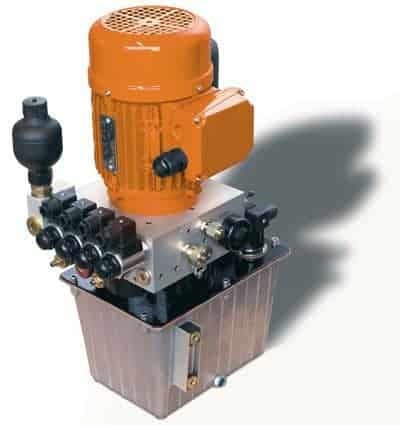 Kor-Pak features both pneumatic and hydraulic water-cooled brakes which possess unique application-specific features. Take a look inside to learn more about the brakes and brands we offer. 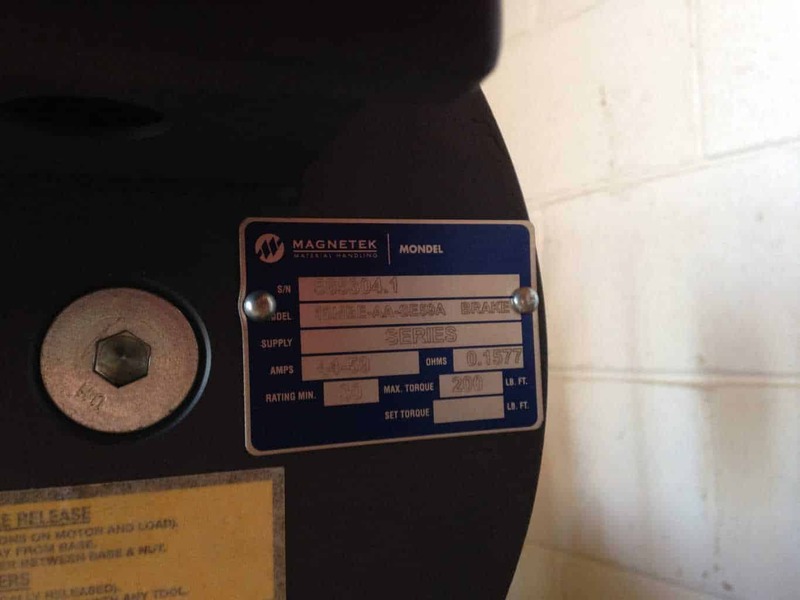 10″ Clark DC Magnetic Brake A..
Spring-set, DC magnet released 10″ Johnson/Elevanja Drum Brake, with stainless steel pins and non-asbestos brake linings. 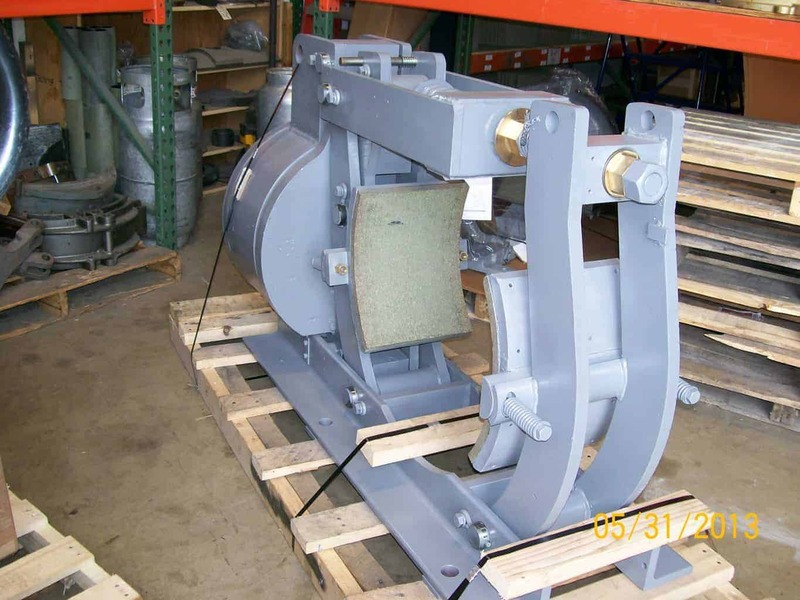 Brand New Mill Duty 10″ Mondel MBE DC Magnetic Brake Assembly, manufactured by Magnetek Uncommon Power. 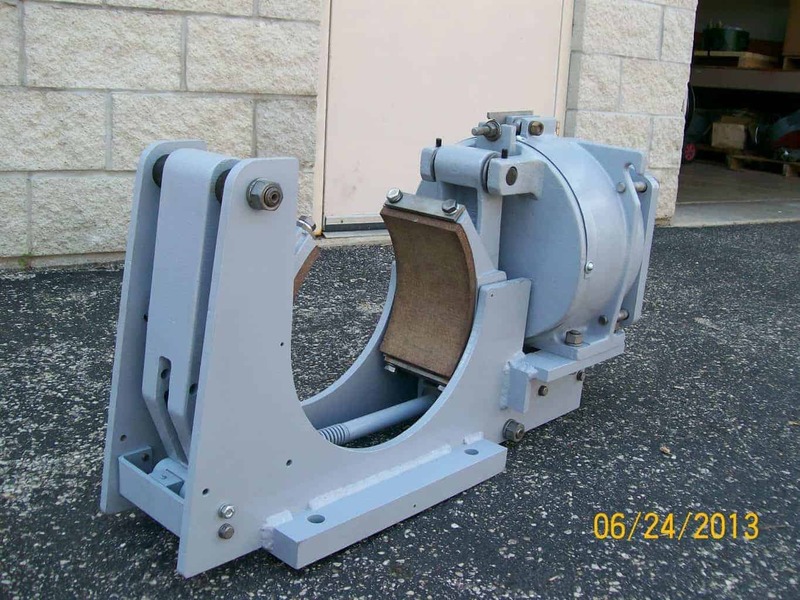 13″ Johnson SMLB Thruster Dru..
16″ P&H SBE Magnetic Dru..
16″ Square D Class 5010 WB Ty..
19″ Cutler Hammer GH505 Brake.. This is an OEM brake assembly rebuilt by Kor-Pak using all new parts including stainless steel pins, bushings, aluminum brake shoe assemblies, putting this brake into drop-in replacement condition. 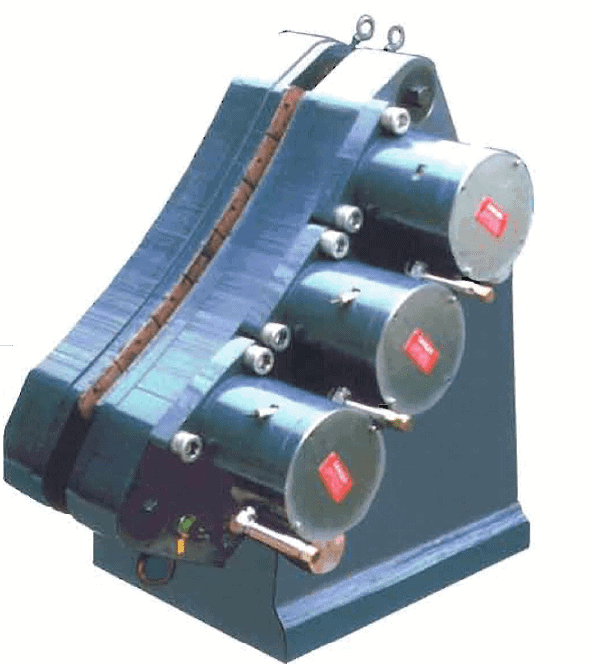 Currently furnished with shunt coil but we can provide you with series as well. 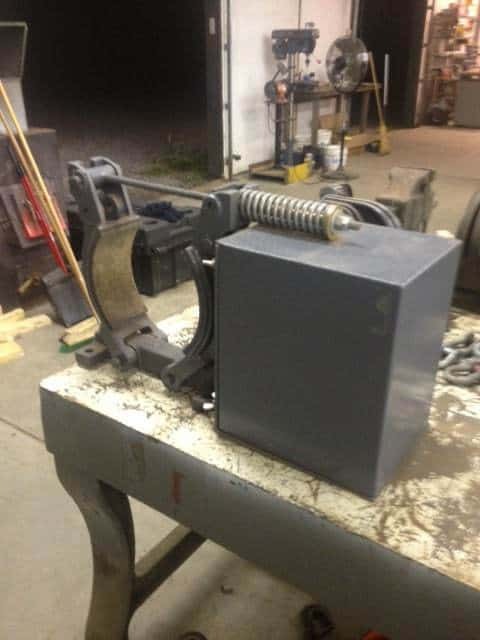 Please reference the motor frame or coil ID you desire upon purchasing. 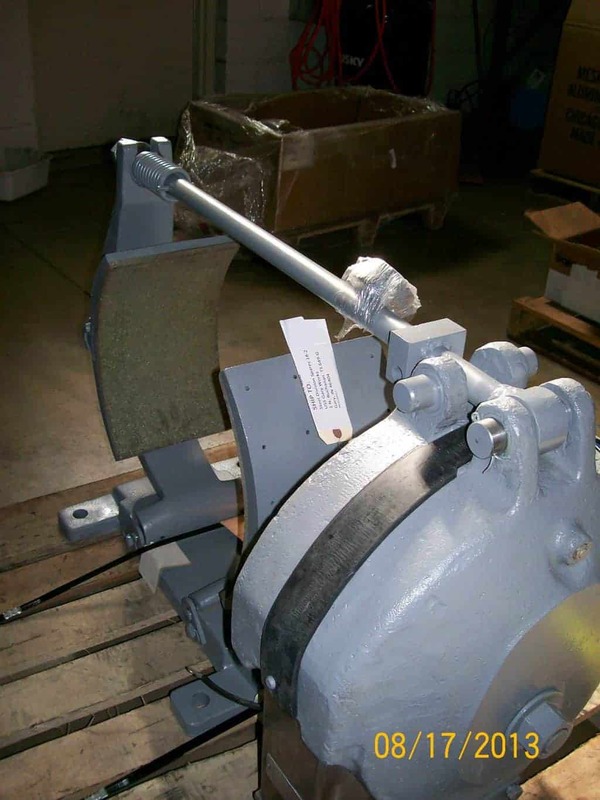 23″ Clark B106 Brake A106-200..
23″ Square D WB Class 5010 F2..
23″ Square D WB Class 5010 Brake Assembly: F2323. 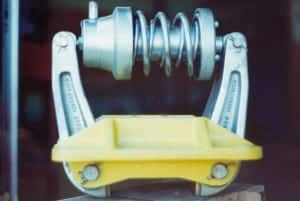 Spring-set, magnetically released drum brake. Furnished with either cast iron or aluminum brake shoes with organic friction linings. 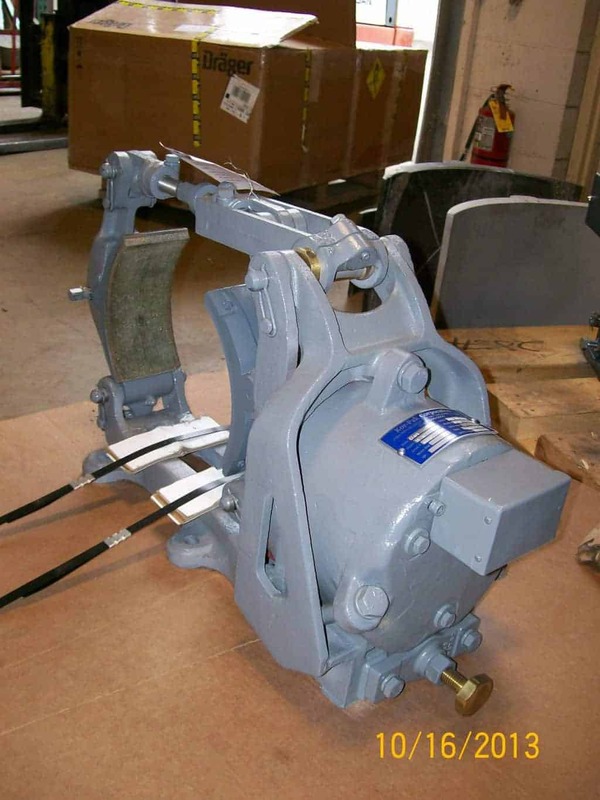 23″ Square D WB Type “T..
28HHH Johnson Industries Hydraulic ..